Is the tiny house trend rekindling America’s passion for camper trailers? It sure as heck seems that way. Registrations for tow-able campers increased by more than 15 percent in recent years. And now that gas prices are hitting historic lows, glamping-worthy trailers are even more appealing—like our eight favorites. Each of the following models will leave you begging for a road trip. You can actually sleep under the stars inside this teardrop trailer by Timberleaf. The camper's huge skylight is one of the largest in the tiny trailer industry according to the manufacturer. You won't need a sports utility vehicle to tow this lightweight camper because it weighs only 1,200 pounds. The back of the Timberleaf features a nicely designed cooking space made of Baltic birch. Base price: $19,750. The Cricket by Taxa Outdoors is an ultra-lightweight camper that many 4-cylinder cars can tow. Even better, inside you'll find creature comforts, like a water heater and outdoor shower system, that aren't staples in similarly-sized trailers. Not impressed? You can add on a few of the camper's many optional features for enhancing your outdoor adventures such as a window-mounted air conditioner or a top loading fridge. Base price: Upon request. The typical camper trailer is a mass-produced item with a fiberglass or aluminum shell. But that’s not the case with the Terrapin, the largest tow-able caravan by Casual Turtle Campers. Each one is handmade to order in Fort Collins, Colorado, using beautiful woods like western red cedar and beetle kill pine. Base price: Upon request. 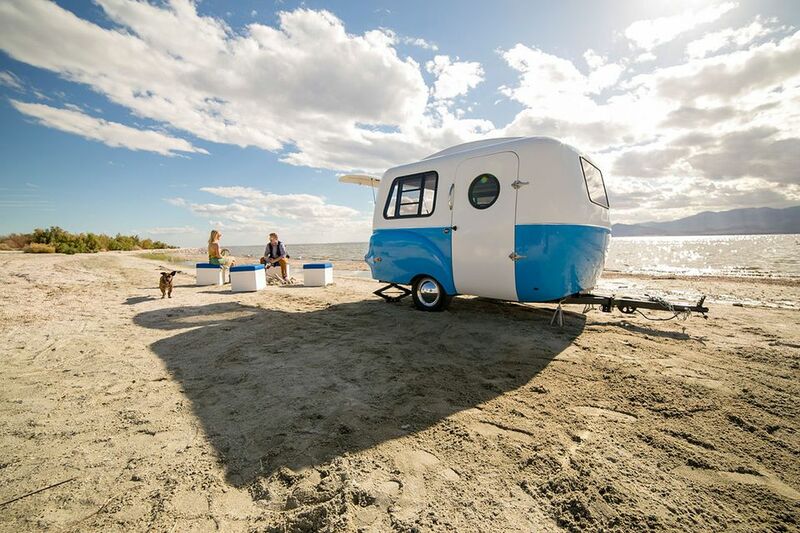 Fans of classic camper vans will flip over the Dinky Dub travel trailer by Dub Box USA. Weighing a mere 1,000 pounds—super light for a tow-able caravan—this vintage-inspired RV is perfect for those looking for something larger than a standard teardrop camper. Equipped with an expanding kitchen, queen-sized sleeping area, and plenty of storage space, the Dinky Dub also offers additional options like an awning over the hatchback and portable water tank. Base price: $13,000. Indulge your wanderlust with the HC1 by Happier Camper. It's a small, retro-modern caravan that most types of cars can tow. It's packed with handy basics for glamping including modular seating for use both inside and outside of the trailer. There's also a sink with portable water storage. Best of all, if you're planning an overnight trip with friends, it can sleep up to five adults. Base price: $18,950. 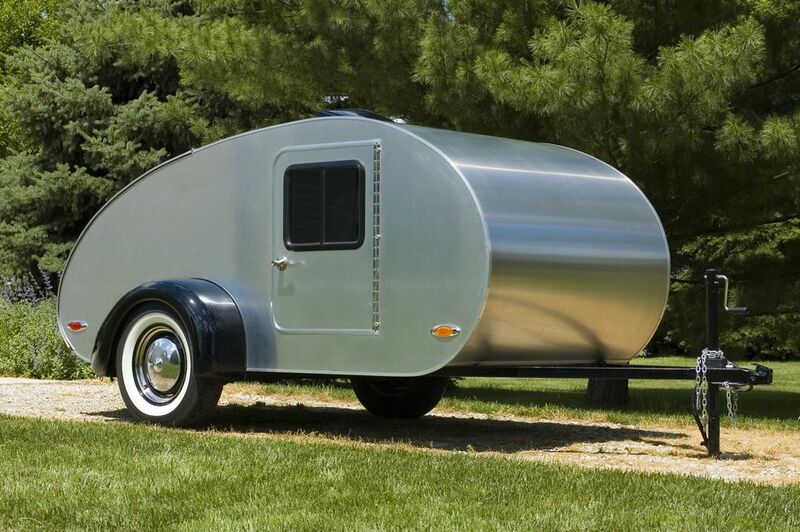 If you're looking for something that oozes retro charm, there's nothing like an aluminum teardrop trailer. This model by High Camp Trailers in Portland, Oregon, has a sleeping cabin in the front and a compact kitchen in the back. Concealed inside the cooking space's birch drawers, you'll find kitchen essentials such as a stainless steel burner cooktop and Coleman cooler. Base price: $16,350. If you're looking for a camper trailer that packs features typically found in tiny houses behold the Timberline by Homegrown Trailers. It's so roomy it can double as a backyard guesthouse or granny pod. While this particular trailer is available in different layouts with optional add-ons, some of the standard features include an indoor shower and toilet, energy-efficient mini-fridge, and 20-gallon freshwater tank. Base price: $39,995. If your preferred mode of transportation is the electric bicycle, you can burn rubber with this bike-tow-able travel trailer. Called the Wide Path Camper, the mini-RV offers immediate shelter, including a comfortable bed for two adults. Base price: $4,290.